Next year marks the centenary of arguably the most important event in modern Irish history, the Easter Rising. Before 1916 the ‘settled will’ of the Irish people was a home rule parliament; the rebellion birthed ‘a terrible beauty’, that would lead, eventually, to Irish independence, in the process dividing the nation, literally and metaphorically. Born Edward De Valera, in Manhattan, to a Basque father and Irish mother, the young De Valera was raised in Ireland after his father died. Against opposition from his family, he attended the Christian Brothers School, often walking the seven miles to school. He won a scholarship to the prestigious Blackrock College. Unlike many, De Valera had found a way out of the dirt poverty of rural Ireland. Remarkably for a man whose 6ft 1in figure dominated Irish public life for more than half a century, there is little evidence of any stable political convictions in the first two decades of De Valera’s early life. At Blackrock, his intellectual formation was decidedly Victorian, and Victorian England at that: the young De Valera had little interest in the Irish language revival or Gaelic sports. In the debating society he supported a motion that “constitutional monarchy as a form of government is preferable to republicanism”. But there are echoes of De Valera the headstrong statesman in his formative years. Teammates attribute an expected rugby cup final defeat to his authoritarian captaincy – he took all the penalties and conversions. Years later, while campaigning for Sinn Fein in America, a travelling companion would remark that the Chief “tends to force his own opinions without hearing from the other fellows and thus thinks he has co-operation when he only gets silent acquiescence”. De Valera was a man of convictions. Although he only started learning Irish to further his teaching career, he became a passionate advocate for the language, and the cultural accoutrements around it. He married his teacher, Sinead Ni Fhlannagain, changed his name to what became Eamon, joined the Irish Volunteers, and within three years was leading a battalion in the Easter Rising. That De Valera survived the Rising when most of the other leaders were executed owed more to luck than his American passport. His battalion was late to surrender, and by time he was imprisoned London was already concerned about the public relations disaster unfolding inside the prison walls at Kilmainham. But the Rising was the making of De Valera. The headmaster was perfectly placed to step into the power vacuum “by virtue of his age, education and understanding of the requirements of leadership”, writes Fanning. 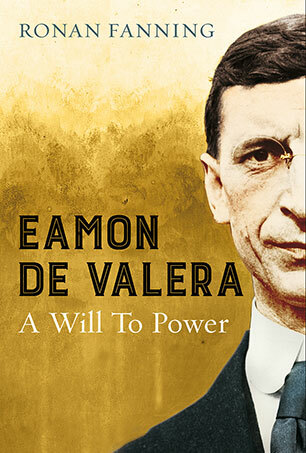 By the end of 1917, De Valera was MP for East Clare, undisputed leader of Sinn Fein and president of the Volunteers. In December 1920, De Valera returned to a country partitioned, charged with making peace with the British. He is often presented as a diehard republican but his vision of independence was not something even most SNP members would recognize: he envisioned Ireland as an external Commonwealth member still linked to the UK. But he was unable to explain this complex idea to his own colleagues, never mind Downing Street ministers. Instead in December 1921, he made a fateful decision that still divides Ireland today – the undisputed Irish leader decided that he would not lead the peace talks delegation, leaving Michael Collins to sign the Treaty establishing the Irish Free State. De Valera railed against the Treaty – Ulster would remain outside the new Ireland, and all representatives would swear an oath of allegiance to the King. But, as Fanning argues, “he opposed the Treaty not because it was a compromise but because it was not his compromise”. As Ireland descended into civil war, De Valera embarked on a tour of Ireland, delivering speeches filled with talk of “Irish blood”. But the Treaty had popular support, and the might of the new Irish government behind it. So, in the 1920s, De Valera began the slow path back to power. He formed Fianna Fail. The party would change the face of Irish politics, and deliver De Valera his crowning achievement, the 1937 constitution making Ireland an independent republic in all but name. De Valera fiercely guarded Irish sovereignty, even during “the Emergency” of World War II when he publicly cleaved to neutrality while privately assisting the Allies at every turn. An innate conservative, he was an unlikely rebel. He never smoked, almost never drank, and presided over a country where government bills were often rewritten under the watchful eyes of the Catholic hierarchy. Power was his sole motivation. By the time De Valera left the Taoiseach’s office for the ceremonial role of president, in 1959, he was practically blind. By then hundreds of thousands were emigrating every year. De Valera is often caricatured as a Catholic zealot whose blinkered vision of postwar Irish autarky stood between Ireland and modernity. But, as Ronan Fanning’s insightful biography shows, “the Long Fellow” was a complex, and conflicted, character driven by an unswerving lust for power whose towering frame still casts a shadow across Ireland today. This piece originally appeared in The Herald. Could Scottish independence realign Ireland, North and South? What a difference a century makes. In 1912 Ireland’s constitutional future seemed irrevocably bound up with that of Scotland. That year the Government of Ireland Bill was introduced by Liberal prime minister HH Asquith, shortly to be followed by a similar home rule measure for the Scots. The rest, of course, is history. The first World War put paid to Irish and Scottish hopes of self-government within the United Kingdom. By the time the conflict was over, Ireland was fighting a war of independence. Scotland was only granted devolution in 1997. Today, Scottish nationalists frequently adduce Ireland in their arguments for a Yes vote. On everything from sovereignty and citizenship to currency and border controls, Ireland is often held up as a model of how to sever a British union. If the SNP view of Irish self-determination tends towards the Panglossian, official Ireland’s take on what is fast becoming “the Scottish Question” appears rather myopic. Recently Irish Government Ministers were told to be “very careful about expressing views” on Scottish independence. Hopefully this public reticence does not extend to the backrooms of Leinster House. Because regardless of which way Scotland votes, constitutional change looks increasingly inevitable. In the North, nationalists have been similarly muted about the possibility of what Tom Nairn termed “the break-up of Britain”. Some excitable unionists have warned that a Yes in Edinburgh could spark a return to violence in Belfast. Surely the prospect of a country roughly the same size as Ireland – one that is only 12 miles away at the shortest point – becoming an independent state could elicit a bit more than this curious mix of silence and shrillness? Scotland and Ireland share a long – and at times difficult – history; might they share a closer, more productive future, too? The idea of an informal “Celtic alliance” encompassing Scotland and Ireland, North and South, is hardly revolutionary. The 6th century Gaelic kingdom of Dalriada, which stretched from Argyll to Antrim, was settled, according to myth, by Irish king Fergus Mór mac Erc. The origin legend’s veracity aside, Dalriada was unquestionably a lively, creative centre that flourished across the Sea of Moyle. It was, as Neal Ascherson writes, “a Gaelic-speaking Atlantic world connected rather than divided by the sea”. These connections did not end with the demise of Dalriada. During the Middle Ages, the almost independent Lordship of the Isles exerted power and influence on both sides of the Irish channel. The Lordship of the Isles effectively ended when the clan Macdonald forfeited their estates and titles to James IV of Scotland in 1493. But three centuries later, United Irishman Henry Joy McCracken could still write gushingly that: “The Scotch and Irish friendly are/Their wishes are the same.” Our relations with Scotland, however, have not always been so amiable. The Ulster Plantations were a disproportionately Scottish affair: between 1650 and 1700, anywhere between 60,000 and 100,000 Scots left for the north of Ireland. The hundreds of thousands of Catholic Irish migrants to Scotland from the mid-18th century were often met with bigotry and discrimination. In 1923, a report entitled Menace of the Irish Race to our Scottish Nationality was presented to the General Assembly of the Church of Scotland. But Scotland is a very different place from the 1920s. Orangeism has long faded as a political force. In 2002, the Church of Scotland apologised for “any part” it played in sectarianism. Scotland’s Irish Catholic community has changed, too – not least when it comes to politics. At the 1974 general election the SNP won 30 per cent, but less than one in 10 Catholics voted for the nationalists. Historian Tom Devine believes Catholics are now more pro-independence than any other group in Scottish society. Northern Ireland, with its strong links to Scotland, has provided inspiration for Scottish nationalists, too. The Belfast Agreement demonstrated to many in the SNP’s upper echelons that moderation and pragmatism could produce seismic change. Raasay-born poet Sorley MacLean envisaged Gaelic Scotland and Ireland as part of a single cultural continuity. The twin Gaelic cultures drifted apart for many years, but are arguably closer now than at any time since the 1940s. Perhaps the time has come for Dublin and Edinburgh to learn from this rapprochement. Even a Scottish No vote in September is unlikely to signal the end of the constitutional story. Former Lib Dem leader Charles Kennedy and Scottish Tory Murdo Fraser are among those who have recently taken to uttering the dirtiest F-word in British politics – federalism – in polite society. A new settlement for Scotland would pose practical questions for Ireland. Edinburgh could look to compete on corporation tax, and to usurp us as the cuddly Celts on the edge of Europe. But political change in Scotland could also be a unique opportunity for Ireland – North and South – to forge a stronger relationship with its closest neighbour. A new Dalriada anyone? This piece originally appeared in the Irish Times. There’s a growing backlash over an event dreamed up by the ad men to celebrate Guinness that could see its focus move from drink to the arts, writes Peter Geoghegan. A couple of years ago I went to Galway for a wedding. I arrived on a wet Thursday night with the wind whipping off the Atlantic Ocean, but it seemed the entire city was out on the town, swaying in the streets or bulging out of the myriad pubs. Even by the less than abstemious standards of “the City of the Tribes”, this was a big night. I’d no idea what the party was for. “Have Galway won the All-Ireland?” I asked, somewhat tongue in cheek, at the reception in my hotel. “No, it’s Arthur’s Day.” I was handed a leaflet featuring a picture of a pint of Guinness, a slogan about celebrating “great people who make things happen” and the logo of Diageo, the international drinks giant that now owns Guinness. Arthur’s Day, basically a marketing gimmick to mark 250 years since the first pint of Guinness was brewed in Dublin, is now in its fifth year. Yesterday at 17:59 – the year of the company’s establishment – people raised pints of Guinness in pubs in over 40 countries around the world, including Jamaica, Malaysia and, of course, Ireland. As part of the event, Diageo paid for secret free gigs at around 500 venues across Ireland by a host of international and national groups, including Biffy Clyro and the Manic Street Preachers. Arthur’s Day has provided something of a fillip for hard-pushed Irish publicans – despite the national stereotypes, pubs in Ireland are closing in record numbers in the face of the massive downturn in the country’s economic fortunes – but the backlash has been building, especially this year. And Ireland’s writers, singers and artists have been in the vanguard of the anti-Arthur’s Day brigade. Actor Gabriel Byrne was, if anything, even less sympathetic to the marketing men’s cause. “The idea that people go out and get absolutely pissed on a day that’s made up by marketing guys – that’s a cynical exercise in exploitation in a country that has a huge problem with binge drinking,” said the Usual Suspects star. This year, Arthur’s Day seems to have hit a nerve with a country jaded with ad men and increasingly aware of its own alcohol excesses. Government statistics show that Irish households last year spent 7.7 per cent of their money, or €6.3 billion, on booze. That’s double what is spent on clothing and more than €2,100 per adult. Ireland tops the European league table in terms of binge drinking, according to a 2010 Eurobarometer survey. The study found 44 per cent of Irish people said they had consumed five or more drinks in a single sitting over the previous 12 months. The EU average is 29 per cent. Arthur’s Day has quickly become the apotheosis of Irish binge drinking. An even-boozier version of St Patrick’s Day – if such a thing can be imagined. Statistics suggest alcohol-related ambulance call-outs increase 30 per cent on Arthur’s Day. No wonder, then, that a boycott was called for by Irish medical professionals. “Alcohol is more affordable than ever. Alcohol is more acceptable than ever. Alcohol is more available than ever. We need measures to address this epidemic. Where does Arthur’s Day fit into all of this?” said Dr Stephen Stewart, director of the Centre for Liver Disease at the Mater Hospital in Dublin. Cirrhosis of the liver is reaching epidemic proportions across Ireland, particularly among younger people. Alex White, Ireland’s deputy health minister, recently described Arthur’s Day as a “pseudo-national event”. The Irish public would seem to agree. A poll on a leading Irish radio show found 74 per cent of listeners opposed to the day. “They shouldn’t call it Arthur’s Day. They should call it Vomit Day,” Aisling Fitzsimons told reporters. Fitzsimons, a 50-year-old manager of a convenience store, said she regularly had to hose down the footpath outside her business after alcohol-fuelled weekend excess. Hungover workers cost Ireland €3.7bn annually. Among the loudest voices against Arthur’s Day has been singer-songwriter Christy Moore. In a scathing song – released yesterday – he dubbed it an “alcoholiday”. “Diageo Diageo have mounted a Crusade/ Creating Arthur’s Day they’ve suckered us into their charade/ Start ‘em off on alco-pops tastes just like lemonade/ Get ‘em into the hit while they’re young and none the wiser,” he sings on Arthur’s Day. Diageo, however, has maintained that Arthur’s Day is all about promoting the arts. “Ultimately, it’s about bringing pints of Guinness, music and the pub together,” said Peter O’Brien, corporate relations director at Diageo, western Europe. In the face of continued cutbacks to the arts budget, Diageo, through its Guinness brand, has begun to play an ever-increasing role in funding the Irish creative scene. As well as the singers and musicians paid for during Arthur’s Day, a scheme called the Arthur Guinness Projects provides money for artists. But in stepping into the funding hole left by the Irish state, Diageo has also created a wonderful marketing opportunity for themselves – and sparked question marks over the commitment of the government in Dublin to tackle Ireland’s drinking problem. The Irish Cabinet is still considering whether to follow Scotland in imposing minimum pricing on alcohol. Restrictions on advertising and event sponsorship have all been mooted, but for now the iconic Guinness logo still adorns everything from sports jerseys to advertising hoardings. Diageo responded to some of the criticism it received this year by saying that it would pay for an additional police presence on the streets for last night’s Arthur’s Day celebrations. But the long-term future of Ireland’s new “pseudo-national event” is unclear. The company says that it is keeping an open mind on changing Arthur’s Day next year to focus less on pubs and pints, and more on the arts, but also insists that nobody is being forced to drink when watching musical performances. But this year’s backlash against Arthur’s Day suggests a growing disquiet among many about the relationship between Ireland, its national drink and its drinking culture. The Guinness Storehouse in Dublin is the country’s most popular tourist attraction. The iconic image of Barack Obama’s visit to Ireland was the president supping “the black stuff”. Even the Queen and Prince Philip watched a pint settle (though neither drank it). A Diageo spokesperson might have unwittingly stumbled on the cause of his company’s Arthur’s Day woes when he said that Irish society had “started to question our relationship with everything: the [Catholic] church, big business, politicians. And we’re questioning our relationship with alcohol”. About time, too. This column originally appeared in the Scotsman September 26, 2013. Earlier this month, Providence Resources announced that an oil field at Barryroe, off the coast of Cork, is expected to yield 280 million barrels. The company’s CEO, Tony O’Reilly Jr, the son of the media mogul, told the Today programme that this was ‘very good news for Providence shareholders and the Irish economy’. The first part of his statement is undoubtedly true: Providence’s share price rose sharply on the back of the Barryroe news. That Ireland’s economy will benefit is much less likely. According to the World Bank, Ireland offers ‘very favourable’ fiscal terms for oil and gas companies. At 25 per cent, Ireland’s government take is among the lowest in the world. Norway’s, by comparison, is 78 per cent; Yemen’s is 95 per cent. Ireland also boasts some of the most generous tax-write offs in the industry: companies can offset all costs before they declare profits, including any ‘incurred in the 25-year-period prior to commencement of field production’, from such activities as drilling unsuccessful wells in Irish waters. When a company finds oil or gas in Irish territory, ownership and control of the resource is transferred in full to the company; no royalties are paid to the state; the company can choose to export the oil or gas; they do not have to land the resources in Ireland or use Irish services or personnel. In the late 1950s, the minister of industry and commerce (and future taoiseach) Seán Lemass sold the first exclusive exploration drilling rights in Ireland for £500 to Madonna Oil, a shell company owned by three American representatives of the Messman-Rinehart Oil Company of Wichita and the Ambassador Oil Corporation of Forth Worth. In 1961, a two-thirds share in the rights was sold to Continental Oil and Ohio Oil International for $450,000. In 1971, Marathon Oil (as Ohio Oil International had become) discovered gas off Kinsale, Co. Cork. The terms of the government deal under which the gas was extracted were so favourable to the company that it became an issue in the 1973 general election. Influenced by Norway’s creation of a state oil company, the new minister for industry and commerce, Labour’s Justin Keating, set about recalibrating Ireland’s relationship with oil and gas companies: the state would have a stake in any commercial find; corporation tax on oil and gas revenue was set at 50 per cent; production royalties would be levied. Keating’s amendments did not last long. In 1987, the energy minister Ray Burke – who in 2005 was jailed in relation to corrupt payments received in office – abolished royalty payments and state participation in oil and gas development. In 1992, the finance minister (and another taoiseach in waiting) Bertie Ahern cut corporation tax for the industry from 50 per cent to 25 per cent, where it broadly remains, despite some alterations to the new licensing terms made by the Green party minister Eamon Ryan in 2007. Ireland’s oil and gas regime reflects the dominant logic of Irish economic policy: low taxes will make Ireland attractive to foreign companies, even if they are simply harvesting the country’s natural resources and creating little in the way of jobs or tax revenue. That speculative Irish licence holders get rich in the process is no cause for concern. A year ago, the minister for communications, energy and natural resources, Pat Rabbitte, announced that 13 new offshore exploration licences had been awarded. ‘Ireland must continue to communicate the message to international exploration companies that Ireland is open for business,’ he said. In 1973, the Union of Students of Ireland published a pamphlet entitledWhat’s Mined is Ours! The Case for the Retention and Development of Irish Minerals under Public Ownership. According to the foreword, ‘those with a vested interest in the development of Irish mineral resources appear to have access to unlimited finance for public relations purposes.’ One of the text’s three signatories was the USI president, Pat Rabbitte. This piece originally appeared on the London Review of Books blog. IRELAND’S devastated economy received a boost yesterday with the announcement that an offshore field at Barryroe, 30 miles off the coast of County Cork, could yield up to 280 million barrels of oil. Providence Resources, an Irish and UK company that has been drilling at six locations off the coast of Ireland, said Barryroe will yield more oil than expected, which could trigger an oil rush off the Republic’s coastline. Mr O’Reilly said the oil recovery rate during exploration had exceeded expectations and, with oil at about $100 per barrel it was a “big moment” for Irish oil exploration and the Irish economy. Ireland has extensive, untapped oil and gas reserves. The area off the west coast alone contains potential reserves of 10 billion barrels of oil equivalent (oil or gas), according to a 2006 study for the Irish government. This estimate does not include areas off Ireland’s south coast, where Providence’s offshore field is located. However, serious doubts have been raised about the benefit of the Providence oil find for the Irish economy. Under a deal signed by former premier Charles Haughey in the 1980s, when a company finds oil or gas in Irish territory ownership and control of the resource is transferred in full to the company. The only guaranteed benefit to Ireland from extraction of resources is a 25 per cent corporation tax on the profits declared from the sale of the oil or gas. Before declaring profits, the company can write off 100 per cent of costs from the previous 25 years against tax, including the cost of previous, unsuccessful wells drilled anywhere in Irish waters and costs incurred in other countries. Ireland’s minister for communications, energy and natural resources, Pat Rabbitte, has admitted that the tax take from oil in Ireland will be much lower than in the UK, but has argued that the low rate will make Ireland attractive for foreign oil companies. Whether the oil from Barryroe will be landed in Cork or elsewhere in Europe remains unclear, but many expect refinement and related processes to take place outside Ireland. Even extensive oil extraction is unlikely to create more than “a few hundred jobs” in Ireland, said Conor McCabe, author of Sins of the Father: Tracing the Decisions that Shaped the Irish Economy. This piece originally appeared in the Scotsman. Noelle McHale bought her “dream home” in a new estate in Ireland’s midlands in 2006 for €175,000 (£142,000 today). But her dream has turned to nightmare with her semi-detached worth only a fraction of that price, and the unfinished estate it sits in considered dangerously unsafe because of toxic gases. “If you light a match it can cause an explosion. I’ve stopped lighting fires, I have to keep the windows open, and the water in the toilet full,” Ms McHale said. Already this year, a build up of methane and carbon monoxide is believed to have caused two blasts at Gleann Riada, on the edge of Longford. In one house, now boarded up, windows and doors were blown out. “It is the luck of god that someone wasn’t killed,” said John McNamara, a chartered engineer and advocate for the estate’s residents. Gleann Riada is one of around 2,800 unfinished housing developments, scars of the Celtic Tiger boom, which pockmark Ireland. Some are almost completed, but others have serious problems. Built on an area prone to flooding, Gleann Riada is worse than most. Subsidence has left concrete walls tottering and footpaths buckled. Inadequately treated sewage is thought to be the primary cause of the build up of poisonous gases. The estate “is unsafe” until “necessary and immediate remedial work” is carried out, Dr Kevin Kelleher, author of a report into the explosions on the site, told the a local paper earlier this month. The developer has gone bust, but the local council maintains that, as a private estate, residents must bear the costs of repairs. Mr McNamara estimates the cost at €5 million. “Who’s got that kind of money?’ asks Ms McHale. With many unable to afford alternative accommodation, most Gleann Riada residents, who hail from Poland, India and Russia as well as Ireland, have been forced to remain on the estate, in fear of their lives. Ireland is now paying a heavy price for the lax planning and building regime of the boom years. In February, two-year-old Liam Keogh died after drowning in a pool of water on an unfinished estate in Athlone, Westmeath, around 30 miles from Longford. In Dublin, more than 240 residents of the Priory Hall apartment complex have been moved out of their homes for more than a year after a court ordered work to make the building safe. It was built by former IRA hunger striker Tom McFeely, declared bankrupt in July. “There is a question as to are these estates the tip of the iceberg?” says Professor Rob Kitchin, director of the national institute for regional and spatial analysis at Maynooth university and the lead author of A Haunted Landscape: Housing and Ghost Estates in post-Celtic Tiger Ireland. Earlier this week, campaigners called on the government to provide support for the up to 40,000 homeowners whose foundations were built using pyrite. When exposed to air or water, pyrite (iron sulphide, or fool’s gold), becomes unstable and cause walls and floors to crack. The government has so far pledged just €5m for the repair of unfinished estates. “They are being left to hang in the wind. The government strategy is ‘we will try to deal with health and safety issues as best way we can and hope for market correction’,” says Prof Kitchin. This piece originally appeared in the Scotsman, October 19, 2012.
devout deference to authority; and a predisposition to denigrate whistleblowers as “informers” all contributed to widespread malpractice in public office. Consequently, Irish corruption, as Elaine A. Byrne writes, “operated within a system rather than a mere aggregation of isolated illegal acts. It had become a market, which, as in the case of every functioning market, has developed internal rules governed by the laws of supply and demand”. 1922, excoriated ministerial colleagues’ failure to submit half-year estimates for their departments during his tenure in office. Paradoxically, this radical zeal contained within it the roots of future corruption. Adopting a narrow definition of corruption as the exchange of public goods for private gain, the Free State’s early leaders saw no need to legislate against conflicts of interest. In 1946, in the wake of a tax scandal, one Irish TD told a sympathetic Dáil that the Ten Commandments and “the ordinary principles of decency and good conduct” were sufficient to ensure probity in Irish public life. Irish policy-making and regulation, to the point where, in the recent boom, tens of thousands of houses were built without access to amenities or, as in the Larry Goodman scandal, the Irish taxpayer was underwriting fraudulent beef exports to Iraq. A political scientist at Trinity College Dublin, and a prominent commentator in the Irish media, Byrne has produced a perspicacious, highly readable account of the way Irish corruption morphed as the state’s political, economic and social structures changed. In the wake of Ireland’s loss of economic sovereignty, the book’s central message – that only a vibrant, transparent political culture offers effective protection against the corrosive power of corruption – seems particularly vital. This review originally appeared in the Times Literary Supplement.